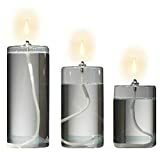 DESCRIPTION: Refillable Pillar Candle Gift Set of 3, 16 oz. of Firefly Paraffin Lamp Oil Fuel and a Plastic Funnel for Easy Refilling. They are Made from Mouth-Blown Borosilicate Glass. Refillable Candles Never Change or Melt. FIREFLY LAMP OIL: We have included 16 ounces of Firefly lamp oil to get you up and running immediately after unpacking your candles. 16 ounces will not fill all 3 pillar candles. Keep in mind that Firefly paraffin lamp oil burns about 6 hours per ounce. Therefore, a 16-ounce bottle with provide about 96 hours of burn time. Times May Vary. FUN SUGGESTIONS: Do you prefer colored lamp oil? We have the perfect solution, Firefly Lamp Oil Dye. We offer (separately) a 3-pack of the primary colors - yellow, red and blue. So, if you want purple, aqua, green, lavender or pink, you can easily create any color to match your decor. 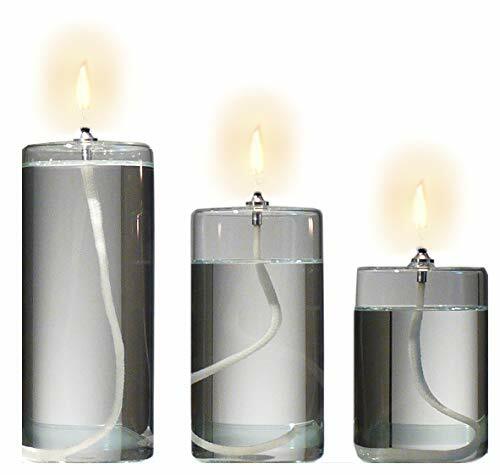 HOW TO USE: Use Our Oil Lamps Alone or in a Lantern or Candle Holder - Makes the Perfect Gift for the Women in Your Life!